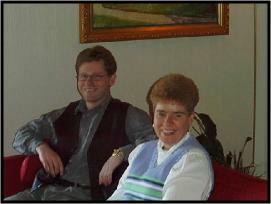 Skip and Bobbie's Postkort 2 fra Norge 1998 - Also checkout our TNG Photos Album. 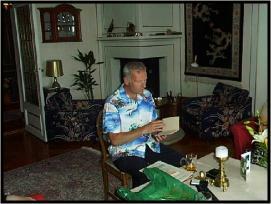 Jens, in his Hawaiian shirt, is explaining a reference from a book he had relating to the family. Cousin Sigmund and Bobbie visit at Jens' home in Oslo. Sigmund drove his motorcycle down from Sandnes for the weekend. 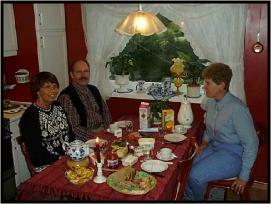 Here we are eating supper in Henny's kitchen. Supper is a light snack later in the evening usually consisting of cheese, meats and crackers. 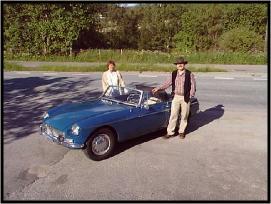 Per and Henny are standing by their MG. Per has restored in. On Saturday it was on display in Stavanger at a car show.